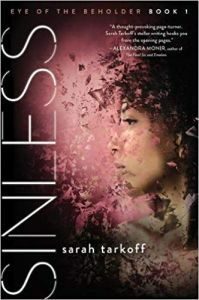 You are here: Home » MEDIA » Books » Sinless (Eye Of The Beholder: Book 1) by Sarah Tarkoff (book review). ‘Sinless Eye Of The Beholder Book 1’ by Sarah Tarkoff imagines a future where the existence of God and one true religion has been proven by sins having a physical impact on the way people look. Since the Revelation, if you commit a sin, your physical appearance will change. This can be anything as simple as a slight deterioration in beauty for lying to suddenly acquiring very serious health conditions extremely rapidly resulting in death for committing murder. Grace Luther’s father is a cleric, so religion has always been a part of their family life. She has always been the perfect believer, until things start happening that make her question her faith. How will Grace manage these changes and how will they change her life? The world-building in this book is generally very clever and well handled. The religious system is gradually explained as it becomes relevant to the story and is frequently illustrated through the impact that characters’ actions have on their physical appearances. I think this is a very clever concept that’s generally well delivered. Something that this book does fairly well is acknowledging and examining the fact that many people who are scientists or are quite scientifically knowledgeable do believe in God or are religious. I also think the book handles religion in general with respect, with one exception. Great Spirit, which is the name of a god worshipped by Native American tribe the Sioux, is the name given to the god of the religion in the book, something that the book does actually acknowledge. Nevertheless, I think using the Great Spirit for the god in the religion in the book is completely inappropriate. Native American people have historically had their cultures and religions misrepresented and appropriated by Americans, something that is disrespectful and that causes much social harm. I think it would have been more appropriate to call the god ‘God’ or something that isn’t part of a real world religion. I also think perceptions towards people who look visibly different and disabled people in general could have been handled a bit better. While there isn’t any majorly problematic disability representation, I think, due to the nature of the world, disability and visible difference should have been given more page time and handled with more nuance, akin to how this book handles religion. Grace is a very unsympathetic character, nevertheless, I think she is right for the story. The book opens with a letter from Grace after the story, in which she discusses that she’s been imprisoned because of mistakes she’s made, so you know that’s going to happen. In that letter, she asks that the reader hear her story to understand where she’s coming from and why she’s done the things she’s done. So, even though I found her irritating at times, it works well for the story that Grace is irritating, quite immature for her age, fairly naive and very self-centred. Through her, the story does a good job of unpacking and exploring our perceptions of different things and each other. The story balances this out, by being really fast-paced. There are loads of twists and turns which keep things really exciting. Furthermore, Tarkoff makes really good use of foreshadowing to build intrigue and curiosity in the reader. Overall, I think this is quite a good read. If you enjoy dystopias or would be interested in reading a book that unpacks science, religion and perceptions, then this is a good read. « Godzilla II: King of the Monsters (TV spot trailers).